not so much because it's that time consuming, but because once you start to see your progress you are really going to want to finish. We ended up staying up pretty late to finish, I just get so excited! So, you think you want to do this to your table? Smart move my friend... smart move. 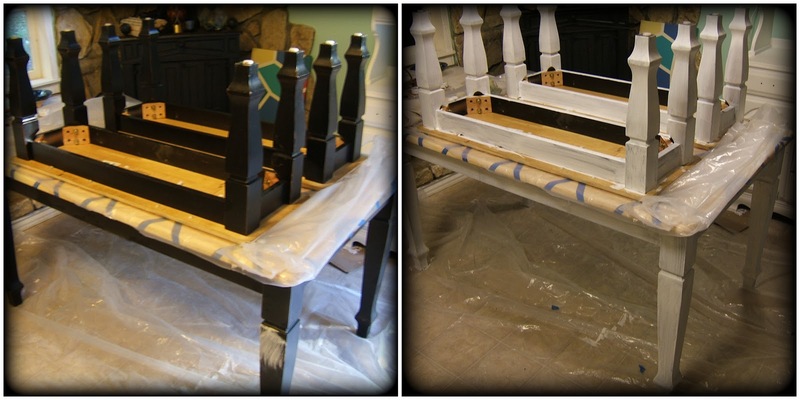 Paint: A quart of whatever leg color, and small bottles of many colors for the top. Straight edge, like a yardstick or similar. 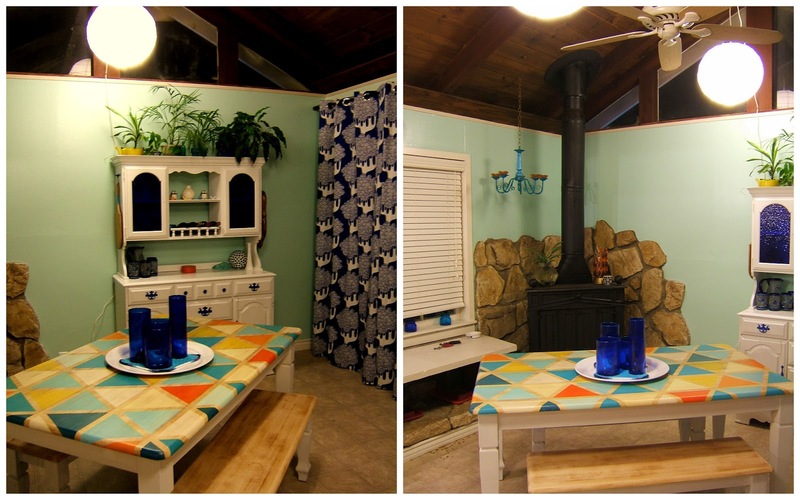 The table in question was from our good friends Kerry & Jerry (thanks y'all!) who gave it to us during our move. Perfect timing, because we gained a dining room in this move! What we didn't know, was that our kitchen would soak up all possible light entering it, and therefore, all furniture needed to be reflective. In other words, white. In even more other words, kitchen-furniture-makeover-time. Look at those two next to each other. Muah! This only took about half an hour to do all 3 pieces. All right, dust these babies off and let's get to work. Snag your tape and channel your inner geometry lessons from back in the day, you'll need them..
For the sake of not losing half the readers here to a long drawn out geometry flashback (painful), I'll explain this step in depth at the end of the post. So scroll down if you are curious. For the rest of you, I'll explain with my measurements which should be a shortcut. If you have a math magician in your home, just bribe them into doing this part. That's probably easiest. In a nutshell, or, on a tabletop rather (ha! ), I put my stripes along the table every 7.75 inches apart. Then, somewhere in the middle, I marked a random spot on the tape edge. Then, I took my protractor (told you we'd need it) and lined it up with that spot, then followed along and made a mark at 120 degrees, or 60 degrees from the other side. Remember all angles in a triangle (interior) add up to 180, so for these equal triangles I needed angles of 60. 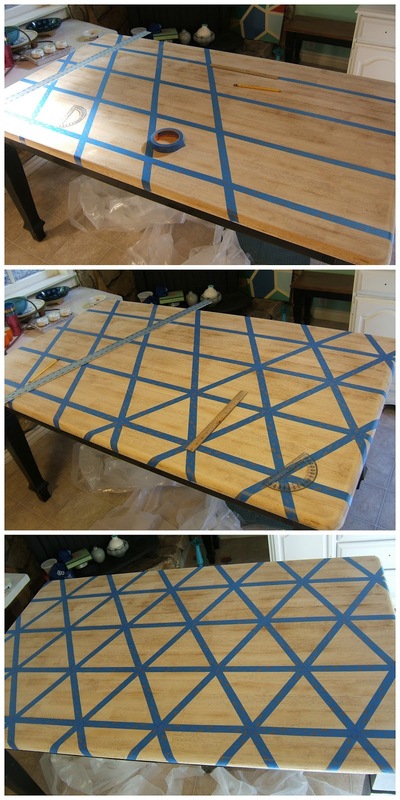 Use your straight edge or yardstick to connect the two points you just made, and place a piece of tape along that edge along the whole table. Now you have a line in which to measure off of. I measured every 9 inches, from that angled line we just made, drew a point, then I used my straight edge to connect all those points with tape. Over and over. So point, measure 9 inches, tape. Measure 9 inches from outside of new line, mark a point, tape. Once all those lines are done, you'll have a lot of diamonds (picture 1). Then use your straight edge to cut those diamonds in half. Repeat & repeat & repeat. Oh, and repeat. Ugh! I hope I haven't bored you to death with that segment! The rest is easy, I swear! Now I took a break there from these dizzying angles to paint the legs. 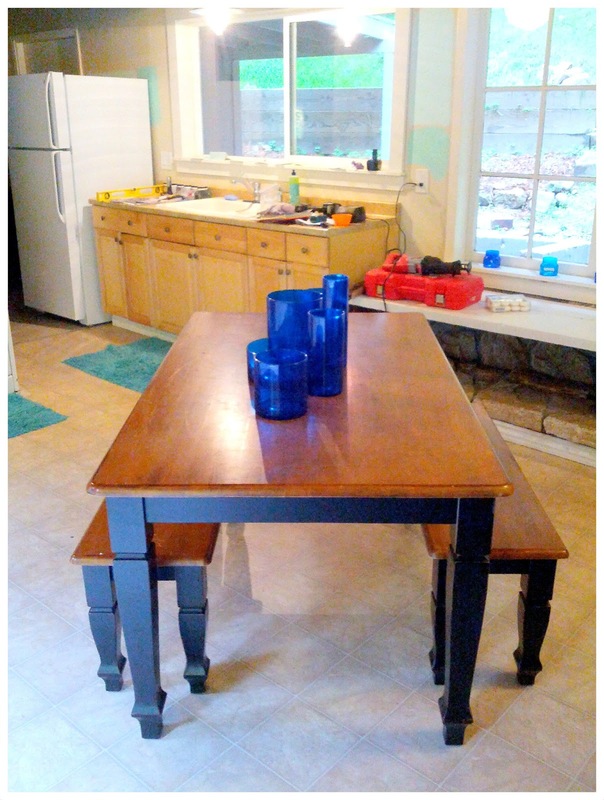 I used the tried & true chalk paint recipe, because I didn't want to sand the legs. Hey, i'm lazy, who cares? It worked. All in all, 3 coats. I wanted them really white, and we won't be distressing, just sealing with polycrylic so I went crazy with the coatings. But hey, at least I didn't have to sand those tiny grooves! Sidestory: I used to think I was so smart, and that I would save money and get more paint per dolla by buying paint samples at home depot. Well, I have no idea where I came up with that, because samples are almost $4. Sure, you get more paint, but these bottles at the craft store were 99 cents! So again, learn from me, huh? This would have cost me around $32 but instead, cost me $8. That's right! As a last minute decision, Ralph had the idea to just use our hands to rub the paint in, so that the wood grain would still show through. This, is why I love him - what a great idea, I hadn't thought of that! 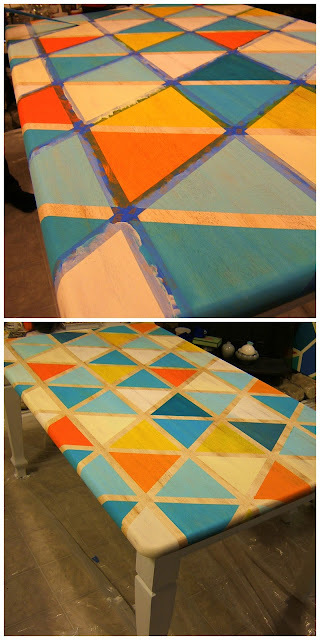 I was just going to fill in the triangles with a few layers of paint. This, in my opinion, is the ultimate in awesome. Anyway, this step seems pretty self explanatory. Put good music on, crack a beer, and get your hands dirty. We rubbed some paint in the triangles with our hands, then wiped the excess off with paper towels. 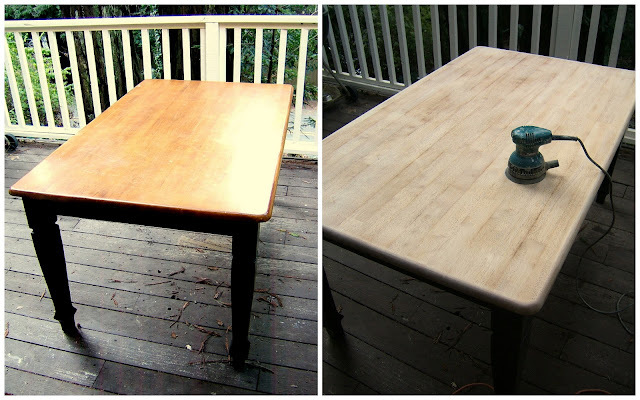 Some of them needed a second coat, you be the judge with your own table. Here, is the most satisfying part of the project (finally!). Tape removal! When you peel, remember, go slow, and pull as exactly opposite the tape direction as possible. 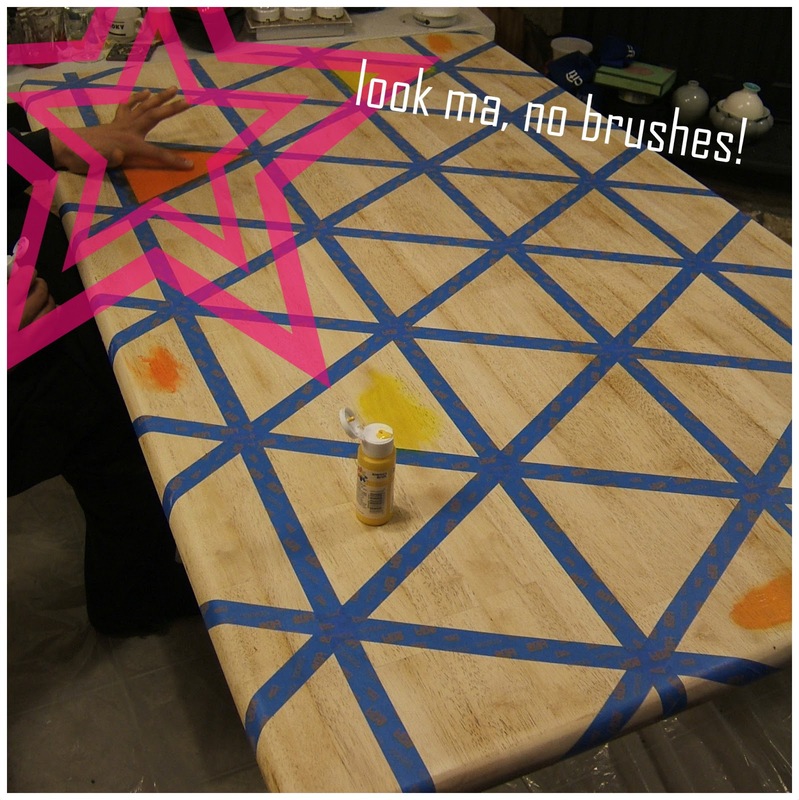 This will help "cut" any bits of paint that decide they'd like to leave with the tape. That felt great. It really did. You can tell in that last photo that I put the poly on already, see the shiny? Beautiful! Look who just stepped up to the center of attention? This table, that's who. I hope you survived that tutorial, it's really not as frightening to do as you might think. The taping was the hardest part, and I say, just jump in - it starts to make sense afterwards! What do you think? Do you love it or is this too busy for ya? Either way, it's sure to catch an eye & start a convo. OK - now as promised, I'll explain a little in depth the geometry magic tricks I had to pull out of the back of my brain for this, so for the rest of you - class dismissed! Haha, thanks for reading & have a great one! In the next post: Questions & Answers for repainting a dresser. 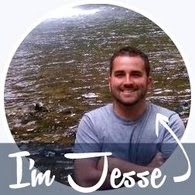 Let's keep in touch: Facebook, Pinterest, Instagram, Twitter & of course, Email. Alright fellow Mathletes (ok, im not a mathlete, but I wish I was) here's what I had to do. 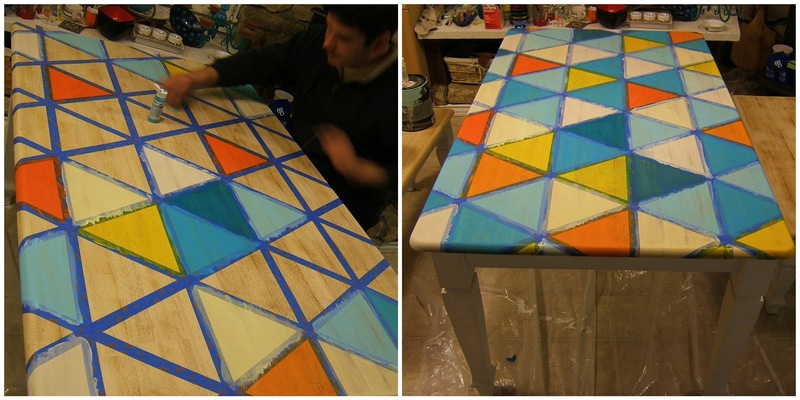 Knowing I needed equilateral triangles for this table, I just let the tape and the angles be the guide on this. 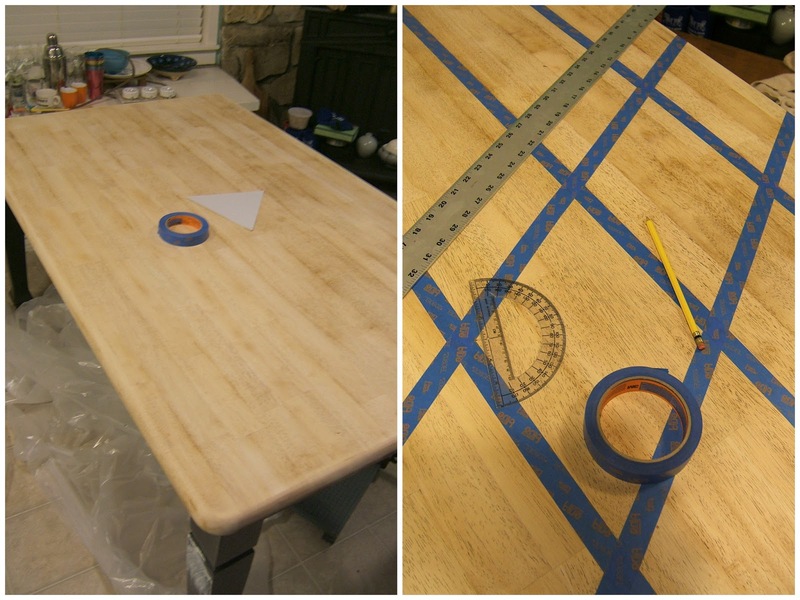 I taped the first stripes off so that they were equidistant, mainly following the planks of wood in the table. I taped a stripe every 4 planks, which happened to be 7.75 inches apart. Then, taking my protractor, measured out from a point to the 60 degree point, which would serve as one interior angle. Like I said in the tutorial. Taped, repeated. You're probably reading this because you are wondering where (and how) I came up with measuring 9 inches apart. After taping the first angled stripe, I measured the side of the tape that would serve as one of the interior sides of the triangle. Essentially, keeping in mind that all sides must be equal, and I needed a specific measurement so that I didn't have to use that protractor over the entire table. ugh! Lucky for me, it was a perfect 9 inches. So measuring from that tape, I just did 9,9,9,9, connect the dots with tape, you know the drill. Once those angles were in, I split the diamonds one time, in the opposite direction, creating the 2 perfect triangles, and remeasured my interior side length. It was something like 8 and 5/8" I believe, with this number, I could then do the measure & mark routine from before, creating perfect triangles. That, my friends, could probably be way better explained by someone who knew what they were doing, mathwise, but it made sense in my brain and that's all I needed. I bet the triangles would have been fine just eyeballing it, haha. Thanks for hanging with me to the end here, gold star for you! This table came out as awesome as usual! :) It looks like this one will be featured in your next book of projects. Love both of them!!! Wow! Awesome! The triangle designs look beautiful! I'm proud to say you did a great job. Congratulations! This is just happy! It vaguely reminds me of a STICKS product. Love it! Absolutely love this! I was trying to find some cute color ideas to paint my handed down farm style table for my apartment and I found this on pinterest and immediately fell in love! Definitely going to do it this week with my roommate! Yay! Send me photos!!! 9redinfo@gmail.com I LOVED this project, I'm so flattered you like it. It really is the focal point of our kitchen now, and ties all the colors together. AWESOME!!! That came out GREAT! Thanks for sharing Morgan! Do you do the legs with poly or just the top? You can poly them if you'd like to protect them, I didn't because eventually I'll be distressing them. Hope that helps! I'm always fascinated every time I see simple things become extraordinary. 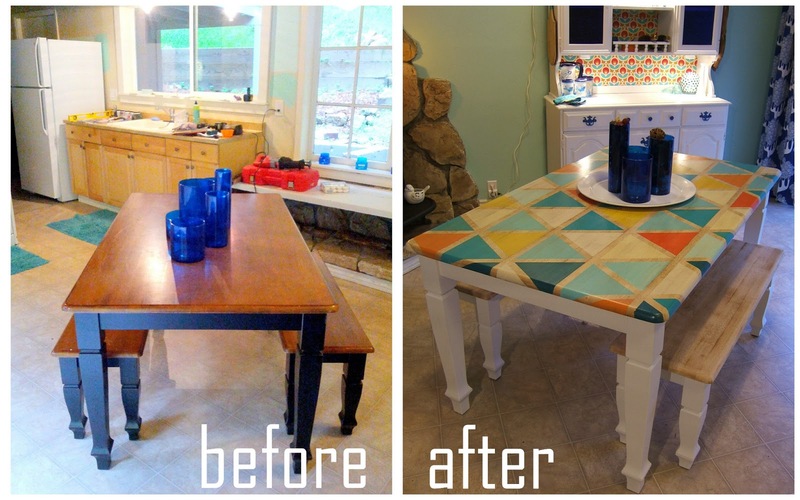 This kitchen table really deserves the attention. 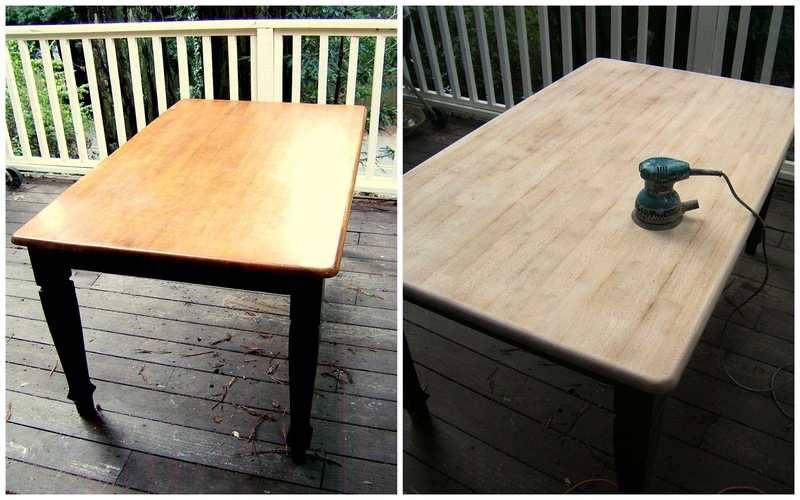 It was just a simple wooden table before, and now look at that! It's very pretty and colorful. It will surely increase someone's appetite. I was spending months...well weeks...maybe days....alright HOURS, trying to figure out what to do with my kitchen table top, and this was it! I love your blog, and it's so great to see other men out there crafting. Hoppin over there now! Thank you! Inspired by your project I painted my boring coffee table almost same. I would love to show a picture but I don't know how to attach it here. Thanks. What a beautiful table.I love it!